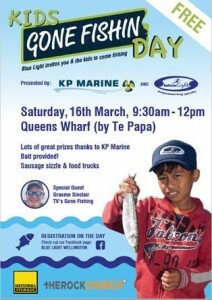 An opportunity to join Graeme Sinclair and the NZ Blue Light team for a couple of hours of free fishing fun for the kids. Kids …make sure you bring along a parent or caregiver, and fishing gear if you have it. and many more who offer goods toward the events for free, or subsidised rates… thank you!!! Keep a check on this page as changes to events can sometimes occur. We will publish more details of the event time, venue, and registration details closer to the event dates.